The "Aspen" is constructed of energy efficient polyvinyl chloride (PVC) which will not warp, peel or corrode and will provide years of trouble free operation and performance. 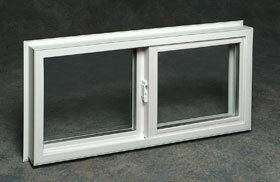 Fusion welded frame and sash corners prevent against water leakage. Available with 3/4" flange for standard mounting or without for cavity mounts. NVSS3216W 32-1/2" x 15-3/4" 32" x 15-1/4"
NVSS3220W 32-1/2" x 19-3/4" 32" x 19-1/4"
NVSS3224W 32-1/2" x 23-3/4" 32" X 23-1/4"